A sneak preview. A vessel ‘beached’ on a ledge above Taylor’s Mistake Bay. 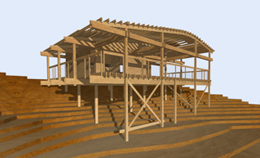 A twin timber hull, boards cladding both roof and walls. A small interior courtyard. Carefully detailed cabinetry the contents of the vessel. These are some of the ideas contained in this new house at Taylor’s Mistake. 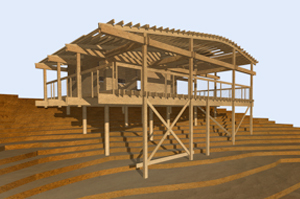 It is a closed-form design, where plan, section and detail use a language of containment. Materials are expressed as wholes, not as parts. 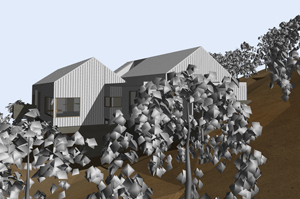 A conceptual approach opposite to the Taylor’s Mistake House has been used at Kenepuru. Here a tiny cabin opens out into the landscape. Materials extend past one another and overlap, building up a rich construction language. 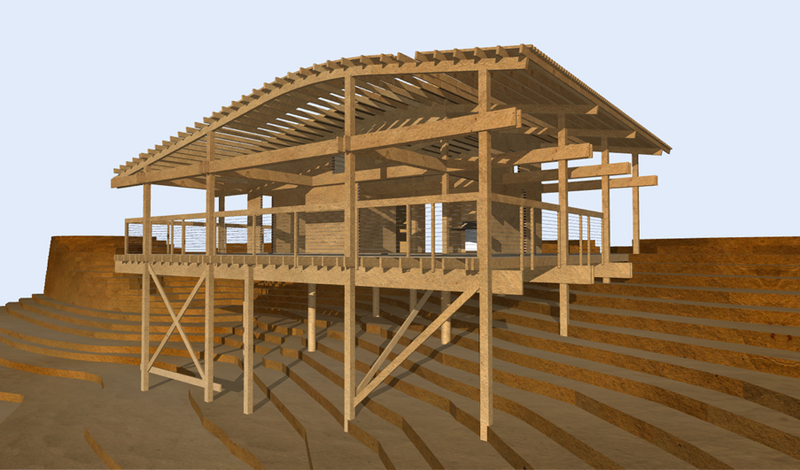 The surrounding deck is considerably larger than the cabin itself; bearers, joists, beams and rafters carry out past the walls of the building proper. 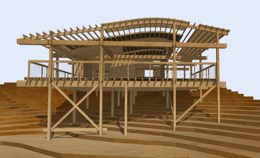 Individual elements are layered and repeated, each joist, each board given autonomy. 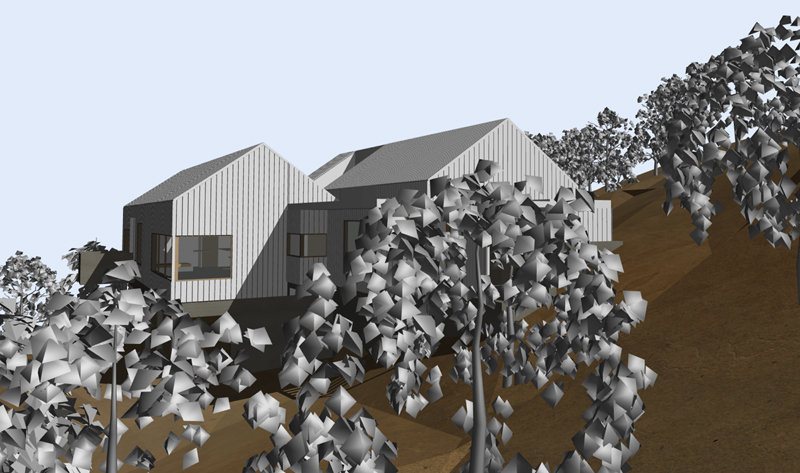 Some 3D renderings of the design. 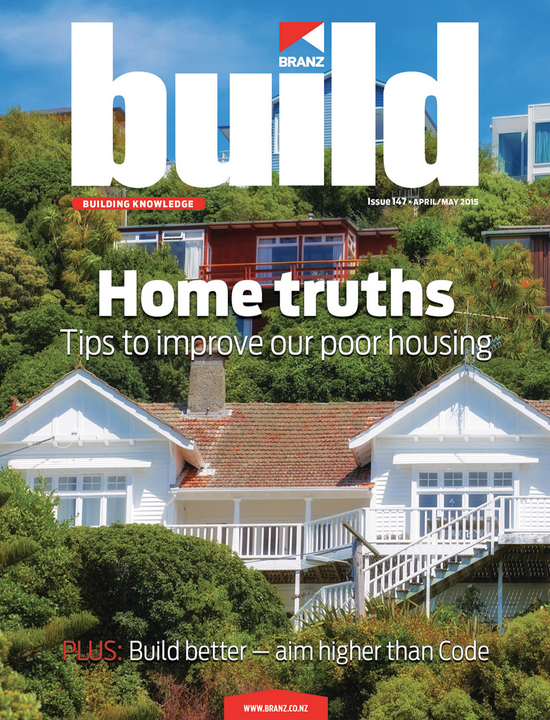 Build is New Zealand’s premier building industry information resource, offering impartial, expert advice. I feature in their April/May 2015 issue talking about everything from visits to Ian Athfield’s house as a teenager to the Christchurch rebuild and challenges to architects in New Zealand today. Tim Nees, in the new role of Architect in Residence at the University of Canterbury, talks to Build about collaboration between disciplines and his hopes and concerns, for the architecture of the re-emerging city. Q. What attracted you to architecture? A. My father worked as an architect and designer, so I grew up in an environment where architecture and design were in the foreground. When I was at high school, he took me to Ian Athfield’s house, and the rest is history. I became Ath’s after-school office boy, and later, after graduating from architectural school, I worked in Ath’s office for 7 years before starting my own business. I feel privileged to have had such a strong foundation in architecture. Q. What does your appointment as architect in residence at the University of Canterbury involve? A. The role is to foster greater understanding between engineers and architects and to encourage early professional collaboration from the concept design stage. By sharing this with students, it is hoped a more effective professional environment will develop. The role is partly in response to the recommendations of the Canterbury Earthquakes Royal Commission. Q. What are the advantages of architects and engineers working collaboratively? A. Complex buildings require the participation of many professions, not just architects and structural engineers, but geotech engineers, fire engineers, services engineers, façade consultants, planners. The list can become quite long. If all the consultants share their expertise at the beginning of the design process before lasting decisions are made, that knowledge can be incorporated in the creative process. This helps [architects] to design effectively, increasing the quality and lessening the risk of expensive changes down the track. Q. How are students taught about this? A. I encourage engineering students to think of themselves as design engineers as well as technical engineers. If, once they graduate, they participate confidently in a collaborative design process, our built environment can only improve in quality, safety and in terms of economy of time, means and materials. Q. Thoughts on the Christchurch rebuild and the contribution of architects? A. The scale of the rebuild represents a considerable challenge. There are huge opportunities for collaboration, and many architects and engineers are doing that well. Seismic research at the College of Engineering at the University has been applied on a number of projects. Many of Christchurch’s new buildings are being heralded for their innovative structural solutions. Some impressive architecture has been built, and more great buildings will be built in the years ahead. But as in any city, there are also the less impressive, pragmatic buildings. Christchurch now has a good many of these. I hope that as the rebuilding continues, poor examples will recede into the background and good architecture will be the dominant fabric of the city. It’s crucial for architects and engineers to get public buildings in the central city right. These form the emotional heart of the city. The public needs to feel they belong in the public realm, to feel a sense of identity with the buildings they walk past every day. The city can’t only be generic commercial, retail and hospitality venues. Buildings with power and resonance are essential. The Cardboard Cathedral has become a new symbol for Christchurch already, as has the Re:Start Mall. This is wonderful, as they are symbols of hope and business as normal but in the longer term, they are transitory buildings. The Arts Centre has survived and is being well restored, but a lot will rest on the success of buildings like the new cathedral and the new library. These buildings will need to be deep, rich examples of architecture. Q. Nationally, what issues do architects face? A. The biggest issue is the position architects hold in the marketplace. We are faced with a market that favours expediency over quality, low cost over investment, time constraints over design development. Architects are struggling to communicate the value they can bring to the built environment, when the built environment itself does not seem to be highly valued at a government or commercial level. When the built environment is primarily shaped by developers, investors and bulk suppliers, it is difficult to wave the quality flag or the built-culture flag and say, ‘hey, architects can provide all these advantages.’ Other parties judge these advantages to be disadvantages. Other building professionals, with perhaps less awareness of the effects a poor or average building has on the urban environment, have been quick to provide services. This has had a negative effect on architects and architecture generally. Effective collaboration between architects and engineers, for instance, could give both a stronger position to leverage improved outcomes for the natural and built environment. Instead of defending the positions we’ve traditionally taken, architects need to discover new ways of working together with other industry professionals to build new types of position and influence within the industry. Some information about my new role in the Engineering Department at the University of Canterbury, where I am currently the Architect in Residence. 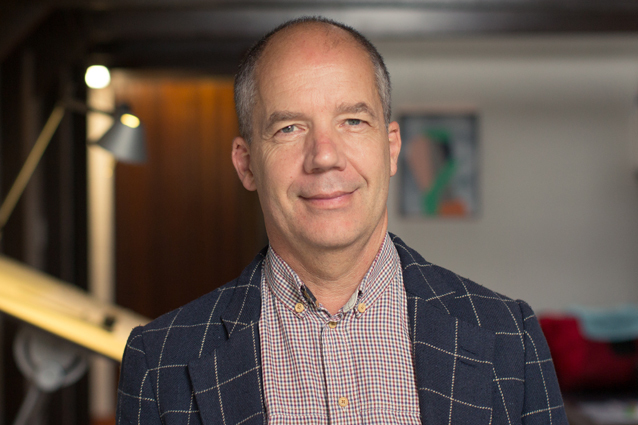 The University of Canterbury has appointed Christchurch architect Tim Nees as the inaugural Architect in Residence within its College of Engineering. The residency has support from Sir Miles Warren’s Warren Architects Education Charitable Trust and from former graduate Jim Rutherford. Professor Mark Davidson, head of civil and natural resources engineering, says the trust and Rutherford have been crucial in creating the new position. “The Architect in Residence will provide a catalyst for developing more systematic and effective interaction between the architectural and engineering professions. More specifically, this unique initiative will provide important opportunities to broaden the education of our engineering students in an architectural context. “The residency will also contribute to our education and research activities in earthquake engineering at the postgraduate level, where UC has considerable expertise and there is a need to further develop that specialist expertise in an architectural context,’’ Professor Davidson says. Nees is one of New Zealand’s highly respected architects and a Fellow of the New Zealand Institute of Architects (NZIA). He was apprenticed to Ian Athfield at Athfield Architects in the 1980s. 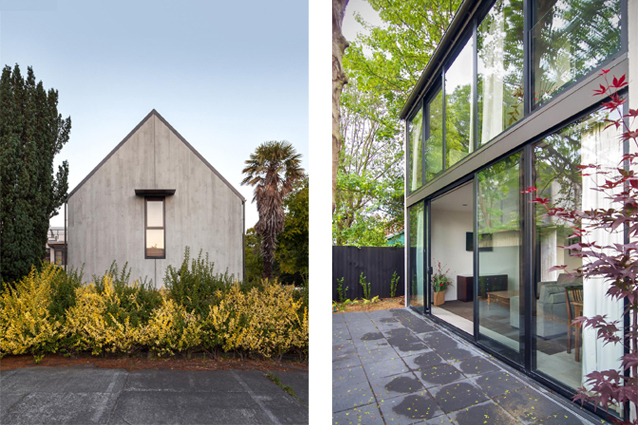 His work has won 20 NZIA Awards for Excellence in Architecture, including the top national award. Nees is a senior design architect on a wide range of commercial and residential projects in Christchurch, Dunedin and Wellington. “This is an honour to be the first architect in residence at the university at an exciting time of the Christchurch rebuild. Some of the world’s great cities have at some stage been rebuilt following significant disasters. They wouldn’t be the cities they are today had disaster not once struck them down,’’ Nees says. “The great Fire of London enabled Christopher Wren to build St Paul’s Cathedral. Lisbon gained an elegant neo-classical city centre after their 18th century earthquake and deluge. Tokyo has been rebuilt several times following earthquakes and fires. Napier has become known as New Zealand’s charming art deco city, after the devastating 1930s earthquake. What most of these rebuilds achieved was a consistency of urban space and urban fabric. “Christchurch’s rebuild should be less a discussion about architectural style and more a discussion about consistency and the quality of urban space. If the city can support a vibrant city life and provide spaces where people want to be, the built backdrop becomes less important. “It is when the design of city buildings is unsympathetic or intrusive and negatively affects the quality of urban life – whether that is due to the way the building relates to the spaces around it, or the way it affects views and wind and sun – that the urban quality is reduced. “Riverside walks, lane ways and squares, the way cars are routed through the city – if these things are done well then a building’s integration in the street is more important than its individual style. One would hope that, in time, the buildings that are being built will relate well to the city they are making and achieve an overall consistency of city fabric. But this needn’t be a consistency of style. Urban environments can be enriched by the unexpected. With New Zealand almost into the icy grip of winter it’s also film festival time. 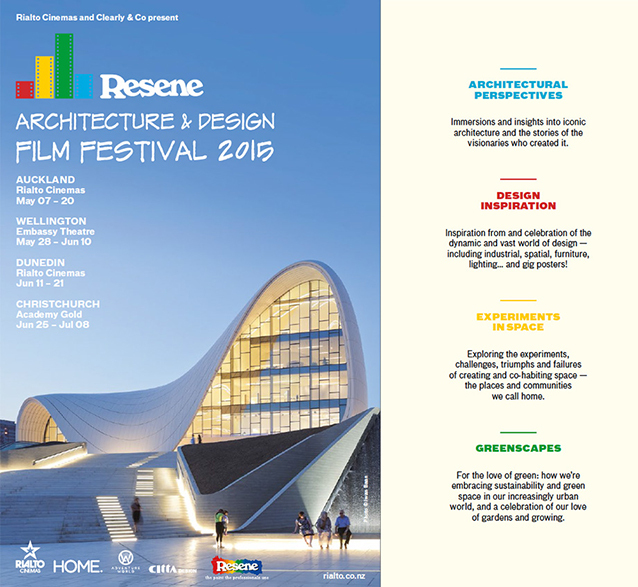 This year Resene is working with Rialto Cinemas and Clearly & Co to bring us the fourth Resene Architecture and Design Film Festival. The movies are divided into four separate spheres: Architectural Perspectives, Design Inspiration, Experiments in Space, and Greenscapes. My must-see picks for this year are screenings of two Sir Ian Athfield movies: Architect of Dreams directed by Geoffrey Cawthorn and Architect Athfield directed by Sam Neill.